Mama of 10 : Something Beautiful! My 5 year old and 7 year old daughters just had their end of the year ballet recital. I can't tell you how much I enjoy watching them, not just on stage but getting ready for the "big performance." What is it about girls that makes them love to dress-up, put on make-up, do their hair and just look beautiful?! I really believe God made them like this and that God is a God of beauty. Just look around at the beautiful creation He has made and all the beautiful children around, and you can see that He loves beauty. There is something so special about the pure, innocent beauty of a little girl. In this picture above they were so excited to show their Daddy their costumes as he had them posing on the front porch. I love the femininity of ballet too. It's classic, timeless and the music is gorgeous. My sister and I took years of ballet and don't regret any of it. My older daughter took for over 7 years and then felt it was time to stop. This was my first year to have 2 daughters performing and it made the night so very special. Caroline and Ellie, I love you and think you are beautiful no matter what! I'm so glad God gave me you! Our computer crashed and I have not been able to read your blog. I am all caught up now. You don't like summer, I remember Ron saying it was his favorite time of the year. It is mine also, I do not love the heat, but I love the smells and the laziness, and I do not have to wear shoes. Hi! Thanks so much for the book suggestion! I'm going to check it out for sure! 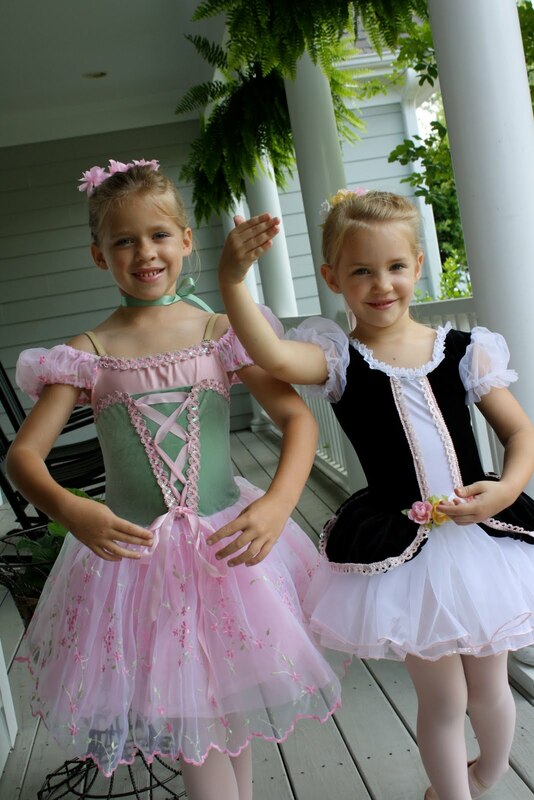 Your little ballerinas are so precious! My daughter took tap and ballet until about age 6. Love those years...the tutus and recitals and flowers. How sweet!